This high quality sauce pan features 3-ply encapsulated 4mm aluminum core bottoms for even heating. Upscale the quality of your meals and look of your commercial kitchen, cafe, diner or home kitchen with this professional cookware. This high quality sauce pan features 3-ply encapsulated 4mm aluminum core bottoms for even heating. Upscale the quality of your meals and the look of your commercial kitchen, cafe, diner or home kitchen with this professional cookware. Fry Pan Stainless Steel 8"
This high quality fry pan features a 3-ply encapsulated 4 mm aluminum core bottom which provides even heating. The handle is strong and includes a hanger hole for your cookware rack. Upscale the quality of your meals and the look of your commercial kitchen, cafe, diner or home kitchen with this professional cookware. Fry Pan Stainless Steel 9"
Fry Pan Stainless Steel 11"
Fry Pan Stainless Steel 12"
This high quality fry pan features a 3-ply encapsulated 4 mm aluminum core bottom which provides even heating. The helper handle assists with carrying and includes a hanger hole for your cookware rack. Pick one up for your commercial kitchen, cafe, diner or home kitchen. Upscale the quality of your meals and the look of your commercial kitchen, cafe, diner or home kitchen with this professional cookware. Fry Pan Stainless Steel 14"
Fry Pan Non-Stick Stainless Steel 8"
This quality fry pan features excellent anti-corrosive properties and 3-ply encapsulated 4 mm aluminum core bottom for even heating. The handle is strong and includes a hanger hole for your cookware rack. Pick one up for your commercial kitchen, cafe, diner or home kitchen. Fry Pan Non-Stick Stainless Steel 9.5"
Fry Pan Non-Stick Stainless Steel 11"
Fry Pan Non-Stick Stainless Steel 12"
This quality fry pan features excellent anti-corrosive properties and 3-ply encapsulated 4 mm aluminum core bottom for even heating. The helper handle assists with carrying and includes a hanger hole for your cookware rack. Pick one up for your commercial kitchen, cafe, diner or home kitchen. 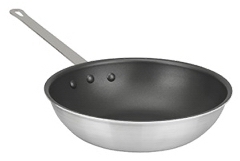 Fry Pan Non-Stick Stainless Steel 14"
This quality fry pan features excellent anti-corrosive properties and 3-ply encapsulated 4 mm aluminum core bottom provides even heating. The helper handle assists with carrying and includes a hanger hole for your cookware rack. Pick one up for your commercial kitchen, cafe, diner or home kitchen. 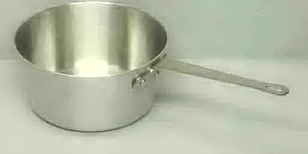 This heavy duty quality 3 quart saute pan is 10" in diameter 2.5" deep and 3.75mm thick. This heavy duty quality saute pan is a great size for feeding a crowd. 5 quarts, 12.5" wide 2.5" deep 3.75mm thick. 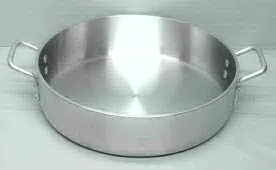 Saute Pan Large Aluminum 14"
This is a large, deep pan for cooking for a crowd! It is heavy duty quality, 14" in diameter 3.5" deep 3.75mm thick. The two helper handles will assist you when moving this large pan. This is a light weight chef's skillet great for those on a budget but still desiring quality. 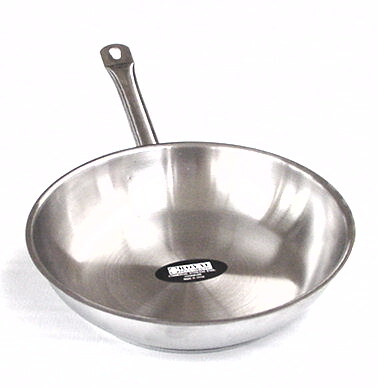 Stir Fry Skillet Aluminum 11"
This is an 11" diameter steep sided stir fry skillet with narrow flat bottom and non-stick coating. Makes stir fry a breeze! 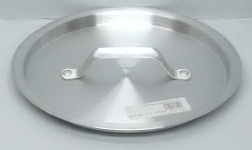 Stir Fry Skillet Aluminum 13"
This is a 13" diameter steep sided stir fry skillet with narrow flat bottom and non-stick coating. Makes stir fry a breeze! 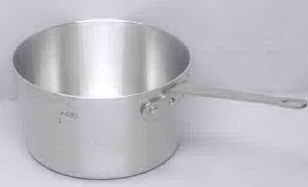 This is a quality, heavy duty yet affordable sauce pan. Great for your commercial or home kitchen. 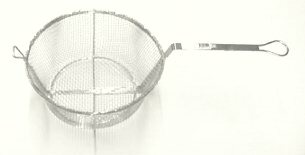 Chrome basket is 5.5" wide, 5.5" deep, 13" long plus handle. Medium sized fryer for frying chicken and much more. Great for your grill, food truck or home kitchen. Large fryer for big jobs. Perfect for your commercial kitchen, food truck, snack bar or home kitchen. This set includes the fryer and fryer basket. 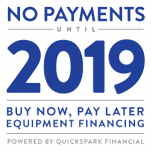 This is a great value for your cafe, food truck or home kitchen. A GREAT VALUE for frying up food for a crowd! Perfect for your restaurant, cafe or food truck.